Solar Batteries as the name suggests are powered by solar energy. It is a rechargeable battery that integrates a solar cell with battery power storage. It is also a tubular battery and uses captive power for its energy source. 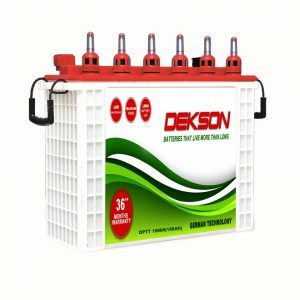 Dekson Solar batteries are designed to last longer in any weather condition. Boost the effectiveness of your solar panels with our batteries that require minimum maintenance and give you superior performance. 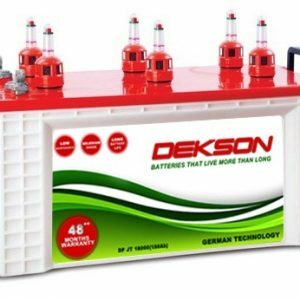 Partial State Charge Condition – The batteries are designed to operate in partially charged conditions even in the non-sunny days. Water Level – Microporous ceramic vent plugs with water level indicators. 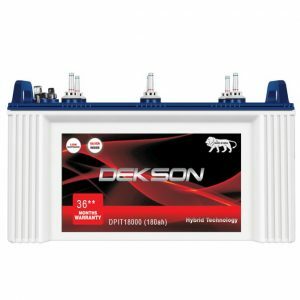 Low Maintenance – Due to the low antimony content the batteries are easier to maintain. The low rate of self-discharge – Designed cycle life at C10 discharge ( at 27*C,1.85 VPC ). Superior Voltage – Ideal for cyclic applications due to superior voltage and energy output profile. Excellent Efficiency – Excellent Ampere – an hour and Watt-hour efficiency.